Join us for the very special fourth Occulto Night of the 2016 season! 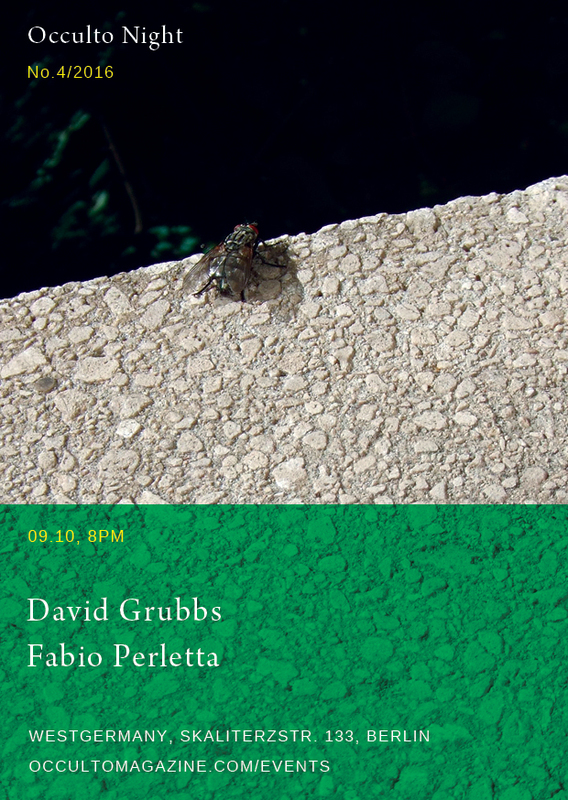 David Grubbs is bringing to Berlin (and other European cities) his latest solo record Prismrose—“a nearly wordless collection of six pieces for electric guitar, all given real time to breathe and mutate”—and will be the main guest at our beloved WestGermany. The American composer, outstanding guitarist, pianist and singer probably needs no further introduction for our regular audience—more about him and about the new album in this recent TAZ article www.taz.de/US-Musiker-David-Grubbs/!5326859. Grubbs has released thirteen solo albums and appeared on more than 150 commercially-released recordings, the most recent of which is Prismrose (Blue Chopsticks, 2016). In 2000, his The Spectrum Between (Drag City) was named “Album of the Year” in the London Sunday Times. He is known for his cross-disciplinary collaborations with writers Susan Howe and Rick Moody, visual artists Anthony McCall, Angela Bulloch, and Stephen Prina, and choreographer Jonah Bokaer, and his work has been presented at, among other venues, the Solomon R. Guggenheim Museum, MoMA, the Tate Modern, and the Centre Pompidou. Grubbs was a member of the groups Gastr del Sol, Bastro, and Squirrel Bait, and has performed with the Red Krayola, Will Oldham, Tony Conrad, Pauline Oliveros, and Loren Connors, and many others. He is a grant recipient from the Foundation for Contemporary Arts, a contributing editor in music for BOMB Magazine, a member of the Blank Forms board of directors, and director of the Blue Chopsticks record label. FABIO PERLETTA is a sound/installation artist and curator living and working in Berlin, Germany. He creates immersive auditory fields which engage listeners to experience intimate and meditative states, using the sound as a vehicle for conceptual investigation and sensorial stimulation. Through an extensive study of Zen practices, he combines notions of minimalism, presence and silence, revealing a complex approach to the sound matter. His works have been exhibited worldwide at festivals and art spaces including A×S Festival (Pasadena), BlueProject Foundation (Barcelona), Museum of Modern Art (Medellín), SoundFjord Gallery (London), Café OTO (London), O’ (Milan), Kid Ailack Art Hall (Tokyo), roBOt Festival (Bologna), Auditorium Parco della Musica (Rome) and more. Perletta’s solo and collaborative recordings have been published by LINE (US), Dragon’s Eye Recordings (US), Yugen Art (IT) and his own imprint Farmacia901 (IT). He works for the curatorial research program Lux and co-runs the visual and sound art studio Mote with Davide Luciani. The OCCULTO NIGHT series brings good independent music in Berlin with a focus on experimentation, cross-genre projects, rare performances and new material; it is informed by and closely connected with the vision and interdisciplinary attitude of the yearly science and arts publication Occulto.